Auriculotherapy is a therapeutic intervention in which the auricle of the external ear is utilized to alleviate pain, dysfunction and disease as represented and manifest throughout the body. The auricle of the ear is a complete Microsystem of the human body. All vertebra, sympathetic/parasympathetic nerves, spinal nerves, visceral organs and the central nervous system, and including all anatomical sites and many functional points are represented on the ear. They total over 200 specific acupuncture points. While originally based upon the ancient Chinese practice of acupuncture, the somatic tropic correspondence of specific parts of the body to specific parts of the ear was first developed in France by Dr. Paul Nogier. All systems of acupuncture began originally in China with the Yellow Emperors Classic of Internal Medicine compiled in 500 B.C. In this text, the six yang meridians wereB.C. connected to the auricle of the ear. Whereas the six yin meridians were indirectly connected to the ear by its corresponding yang meridian. These ancient Chinese ear acupuncture points were scattered over the auricle of the ear. Ancient Egypt, Greece, and Rome between 500 B.C. and 100 A.D.. had recorded clinical uses of earring’s and other forms of ear stimulation for various problems particularly in the treatment of sexual and menstrual disorders which Hypocrite’s and Galen recorded. After the fall of Rome approximately 200 A.D.. ancient medical records were found in Persia where the medical treatment for sciatic pain was cauterization on the ear. From 1500-1700 the Dutch East Indian Company, while merchant trading in China brought many Chinese acupuncture procedures back to Europe including the use of ear acupuncture. It was the Dutch East Indian Company that saw acupuncture being used in the orient where medicine was placed next to the needle site and they then developed the Western hypodermic needle from Chinese acupuncture needles. Sporadic clinical reports in Europe were discussed with the use of ear cauterization to relieve sciatic pain. Then in 1957, Dr. Paul Nogier, a physician from Lyon, France observed the occurrence of scars on the ears of a patient who were successfully treated for sciatic pain by French lay practitioners. Dr. Nogier then developed a somatatopic map of the ear based upon the inverted fetus concept. His work was first presented in France and then published by a German acupuncture society and then finally translated into Chinese. In 1958, a massive study was initialed by Nanking Army Ear acupuncture research team which verified the clinical accuracy of Dr. Nogier’s inverted man concept of the little man on the ear. During the cultural revolution, the “barefoot doctors” were taught the easy techniques of ear acupuncture to bring healthcare to the Chinese masses.n of names of auricular anatomy in location of ear reflex points. In 1980, a double blind experimentally controlled research study at UCLA Pain Management Center department of anesthesiology UCLA School of Medicine conducted a research study by Richard J. Kroeuning M.D., Ph.D and Terry D. Oleson Ph.D. This study reported in PAIN verified the scientific accuracy of auricular diagnosis. There is a statistically significant level of 75% accuracy achieved in diagnosing musculoskeletal pain problems in 40 pain patients. Specific areas of height and tenderness and increased electrical activity on the ear predicted specific areas of the body where some pain or dysfunction would be identified whereas the body free of pathology corresponded to non-active points on the ear. Research that followed throughout the United States utilized both the Chinese and the French Auricular acupuncture points for the treatment of chronic pain problems and the withdrawal from narcotic, alcohol and nicotine. International meetings of the World National Organization in 1990 culminated in a standardization of names of auricular anatomy in location of ear reflex points. While classical acupuncture was first developed in China, its use diminished in the 1800’s when China was dominated by Western powers from Europe. Then with the cultural revolution of Mao Sae Tong, the Chinese with the inverted fetus concept rediscovered and identified auricular acupuncture as a potent diagnostic and therapeutic weapon. Dr. Chen Gong-Sun of Nanking Medical University confirmed the great changes in the practice of ear acupuncture that occured in China in the 1995 international symposium and credited Dr. Nogier with systematizing ear acupuncture as a somatatopic pattern of the inverted fetus for auriculotherapy. More recent Chinese discoveries focused on ear acupuncture and diagnosis as a guide for recommending Chinese herbal remedies. Auricular points are selected according to: (1) corresponding body regions where there is pain or pathology according to the (2) pathological reactive points tender to touch, according to (3) the principles of traditional Chinese medicine, (4) the meridian theory, (5) according to physiological understanding derived from modern western medicine, and according to the (6) known therapeutic effects of a point in addition to the results of experiments in clinical observations of the practitioners. The world health organization and the Chinese government defined a localization of 91 specific auricular points by 1995. Much of the work of auricular therapy was delineated by Dr. Paul Nogier first textbook on the subject , ” The treatus of Auriculotherapy” 1972. In 1950 Dr. Nogier was “intrigued by a strange scar which patient had in the external ear.” He found that it was a treatment for sciatic a involving cauterization of the edge of antihelix on the same side of the neuralgia which had previously been observed. These patients were unanimous in stating that they had received relief for their sciatica pain within hours and even minutes from this ear cauterization. While discussing this anithelix cauterization point for sciatica with a colleague, Dr. Aman Thieu told Dr. Nogier ” the problem with sciatic is the problem with the lumbosacral hinge”. Dr. Nogier then conjectured that the antihelix area cauterized for sciatica could correspond to the lumbosacral joint and whole antihelix could represent the spinal column. The head could correspond to the lobe and the antitragius area. In this way the ear could resemble an embryo in utero. In 1966, Dr. Nogier, discovered a change in the radial arterial pulse following tactile simulation to the ear. This was called the articular cardiac reflex. This pulse change was a modification of the pulse amplitude and way form. It is not related to the changes in the pulse rate. The Auricular cardiac reflex has been important in identifying each ear reflex points corresponding to particular parts of the body where there is pain or pathology. Later, Dr. Nogier revised the name of auricular cardiac reflex to the vascular autonomic signal (VAS) when he realized that this was an involuntary arterial reflex and was not limited to auricular stimulation but was in fact a general vascular continuous reflex that could be achieved by tactile and electrical stimulation for many body areas. The use of a VAS is an integral part of auricular medicine. Besides using mechanical pressure or electrical stimulation, light frequency filters and chemical substances on slides were put over the surface of the ear to demonstrate a VAS response. Wherever there was pathology in the corresponding area of the body. As of this date, Dr. Paul Nogier is still alive in Leon, France, retired. Both ear and body acupuncture take their origins from China. However body acupuncture has remained essentially unchanged whereas ear acupuncture has been greatly modified by the discoveries of Dr. Paul Nogier and further research is continuing to yield never developments in auricular diagnosis and treatment. Body acupuncture is based upon a system of 12 meridians, 6 yin and 6 yang meridians. The ear is a self contained microsystem that affects the whole body. Acupuncture points are anatomically defined in the areas of the skin. They are set at fixed specific locations in body acupuncture and can always be detected. In ear acupuncture , the auricular point can be detected only when there is a problem without he corresponding part of the body in which the ear point represents. The deqi that accompanies stimulation of the body acupuncture point is not observed in stimulation the ear acupuncture point. In both body and ear acupuncture, the points are localized regions of lowered skin resistance or higher skin conductivity. When there is pathology in an organ represented in the meridian point or the auricular point the epidermal skin conductance of the acupuncture point is high. Ear acupuncture points are ipsiladeral or same side as the pain or pathology. This representation on the ear is due to two contralateral projections from the ear to the opposite side of the brain and from the opposite side of the brain back to the opposite side of the body. Using traditional Chinese medicine theory, ear points are ipsilateral because Qi flows up the ipsilateral meridian. Ear acupuncture provides a more scientifically verified means of identifying areas of pain or pathology in the body than traditionally Chinese medicine approaches such as tongue or pulse diagnosis. In auricular diagnosis one can identify specific problems in the body by detecting areas of the ear in which there is discolored, flaky, tender, or have high skin conductivity. This increased conductance is measured by a probe and is repeatable and verifiable. The subtle changes in auricular diagnosis may identify conditions in which the patient and the physician may only be marginally aware of. Both ear acupuncture (auriculotherapy) and body acupuncture can be chemically utilized to relieve pain pathology. They both can be used together or applied separately. Healing not just pain relief. Both body acupuncture and ear points do not simply reduce the experience of pain but also facilitate natural healing processes within the body. Auricular therapy facilitates the natural self regulating homeostatic mechanisms of the body by diminishing over active body functions and increasing underactive physiological processes. Both body acupuncture and auricular therapy can have deep physiological and psychological affects. Direct evidence of endorphinogenic response to auricular therapy has been provided by Abbot et al in 1980, they observed a significant increase in endorphins after acupuncture stimulation was combined with nitric oxide inhalation. Whereas the controlled subjects given nitric oxide without acupuncture showed no elevation of the endorphins. 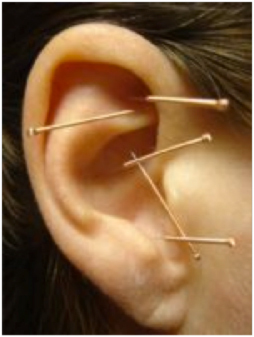 The primary side-effects of ear acupuncture (auriculotherapy) is that the ear itself can become tender and inflamed. Auricular therapy and acupuncture generally is not recommended for patient with pace-makers and during pregnancy. While auriculotherapy does not require the use of needles, ear points may be sensitive to any applied simulation through auriculotherapy treatment. Infection is almost never heard of in auricular therapy and acupuncture and if a patient is afraid of needles, auricular electrical stimulation is the preferred treatment. Dr. Paul Nogier noted that the ear was composed of tissue from each of the three primary types of tissue in the developing embryo. His theory was that each type of embryological tissue on the ear accounts for a different somatotopic functions related to the auricle. Ectodermal tissue, superficial tissue is found in the ear lobe in the helix teal. The ectoderm become the skin, hair, sweat gland, cornea and lens of the eye. Nose, epithelium, teeth, nerves, spinal cord, subcortex of brain, cerebrum and pituitary gland, pineal gland and adrenal medulla. The mesodermal tissue , the middle tissue is found in the anithelix scaphoid fossa, the triangular fossa. The mesoderm becomes the musculoskeletal system of muscles, joints, bones, cardiac muscles, smooth muscles, connective tissue, blood cells from the bone marrow, lymphatic tissues, genial organs, kidney, and the adrenal cortex. The third type is the endodermal tissue, the deep tissue which is found in the concha. The endoderm becomes the gastrointestinal digestive tract, the lungs, tonsil and the respiratory system. The internal organs like the liver, pancreas, bladder, urethra. The neurotein system: natural pain relievers, endorphins, enkephalins, are indigenous morphine chemicals which are found within the pituitary and other parts of the central nervous system and encephalon is subfactor of endorphin. These neurotransmitters occur in the brain at the same site where opiate receptors are found. Both body and ear acupuncture have been found to raise the blood serum and cerebral spinal fluid levels of endorphins and enkephalins. Naloxone is a opiate antagonist which blocks morphine endorphin. Research report from UCLA by Simons & Oleson 1993, Mayer et al 1977, were the first investigators to provide scientific evidence that there was neurophysiological and neurochemical basis for acupuncture and auriculotherapy in human subjects. They demonstrated that the acupuncture stimulation of the body through Large Intestine 4 points, led to a significant increase in pain threshold. They were then able to yield statistically significant reversal of elevated pain threshold by intravenous administration of 0.8 mg of an opiate naloxone. The acupuncture had raised dental pain threshold by over 27 %. There was no treatment control group which showed a 6.9% in dental pain threshold. A total of 20 of 35 acupuncture subjects showed increased pain threshold greater than 20% contrasted with only 5 out of 40 subjects in the controlled condition exhibiting a 20% elevation of pain threshold. Naloxone given to acupuncture subjects reduced the pain threshold to the same level as the control group. TENS ( transcutaneous electrical nerve stimulation) suppresses pain by activating A-Fibers which inhibit the input from C fibers. Acupuncture stimulation tends to activate C fibers which activates super spinal gating systems which then send descending input to the spinal inhibitory neurons which suppresses the pain message. Secondary, stimulation produced analgesia is a pain inhibitory system that has been demonstrated by brain stimulation by the periactiductal central gray matter which reduces the responses to pain in rats, cats, monkeys, and humans. This peripheral stimulation and ear acupuncture points may peripherally activate the pain inhibitory system.